JANUARY 6, 1821. At the age of 77, I begin to make some memoranda, and state some recollections of dates and facts concerning myself, for my own more ready reference, and for the information of my family. The tradition in my father's family was, that their ancestor came to this country from Wales, and from near the mountain of Snowdon, the highest in Great Britain. I noted once a case from Wales, in the law reports, where a person of our name was either plaintiff or defendant; and one of the same name was secretary to the Virginia Company. These are the only instances in which I have met with the name in that country. I have found it in our early records; but the first particular information I have of any ancestor was of my grandfather, who lived at the place in Chesterfield called Ozborne's, and owned the lands afterwards the glebe of the parish. He had three sons; Thomas who died young, Field who settled on the waters of Roanoke and left numerous descendants, and Peter, my father, who settled on the lands I still own, called Shadwell, adjoining my present residence. He was born February 29, 1707-8, and intermarried 1739, with Jane Randolph, of the age of 19, daughter of Isham Randolph, one of the seven sons of that name and family, settled at Dungeoness in Goochland. They trace their pedigree far back in England and Scotland, to which let every one ascribe the faith and merit he chooses. My father's education had been quite neglected; but being of a strong mind, sound judgment, and eager after information, he read much and improved himself, insomuch that he was chosen, with Joshua Fry, Professor of Mathematics in William and Mary college, to continue the boundary line between Virginia and North Carolina, which had been begun by Colonel Byrd; and was afterwards employed with the same Mr. Fry, to make the first map of Virginia which had ever been made, that of Captain Smith being merely a conjectural sketch. They possessed excellent materials for so much of the country as is below the Blue Ridge; little being then known beyond that ridge. He was the third or fourth settler, about the year 1737, of the part of the country in which I live. He died, August 17th, 1757, leaving my mother a widow, who lived till 1776, with six daughters and two sons, myself the elder. To my younger brother he left his estate on James River, called Snowdon, after the supposed birth-place of the family: to myself, the lands on which I was born and live. He placed me at the English school at five years of age; and at the Latin at nine, where I continued until his death. My teacher, Mr. Douglas, a clergyman from Scotland, with the rudiments of the Latin and Greek languages, taught me the French; and on the death of my father, I went to the Reverend James Maury, a correct classical scholar, with whom I continued two years; and then, to wit, in the spring of 1760, went to William and Mary College, where I continued two years. It was my great good fortune, and what probably fixed the destinies of my life, that Dr. William Small of Scotland, was then Professor of Mathematics, a man profound in most of the useful branches of science, with a happy talent of communication, correct and gentlemanly manners, and an enlarged and liberal mind. He, most happily for me, became soon attached to me, and made me his daily companion when not engaged in the school; and from his conversation I got my first views of the expansion of science, and of the system of things in which we are placed. Fortunately, the philosophical chair became vacant soon after my arrival at college, and he was appointed to fill it per interim: and he was the first who ever gave, in that college, regular lectures in Ethics, Rhetoric and Belles Letters. He returned to Europe in 1762, having previously filled up the measure of his goodness to me, by procuring for me, from his most intimate friend, George Wythe, a reception as a student of law, under his direction, and introduced me to the acquaintance and familiar table of Governor Fauquier, the ablest man who had ever filled that office. With him, and at his table, Dr. Small and Mr. Wythe, his amici omnium horarum, and myself, formed a partie quarrée, and to the habitual conversations on these occasions I owed much instruction. Mr. Wythe continued to be my faithful and beloved mentor in youth, and my most affectionate friend through life. In 1767, he led me into the practice of the law at the bar of the General court, at which I continued until the Revolution shut up the courts of justice. In 1769, I became a member of the legislature by the choice of the county in which I live, and so continued until it was closed by the Revolution. I made one effort in that body for the permission of the emancipation of slaves, which was rejected: and indeed, during the regal government, nothing liberal could expect success. Our minds were circumscribed within narrow Iimits, by an habitual belief that it was our duty to be subordinate to the mother country in all matters of government, to direct all our labors in subservience to her interests, and even to observe a bigoted intolerance for all religions but hers. The difficulties with our representatives were of habit and despair, not of reflection and conviction. Experience soon proved that they could bring their minds to rights, on the first summons of their attention. But the King's Council, which acted as another house of legislature, held their places at will, and were in most humble obedience to that will: the Governor too, who had a negative on our laws, held by the same tenure, and with still greater devotedness to it: and, last of all, the Royal negative closed the last door to every hope of amelioration. On the 1st of January, 1772, I was married to Martha Skelton, widow of Bathurst Skelton, and daughter of John Wayles, then twenty-three years old. Mr. Wayles was a lawyer of much practice, to which he was introduced more by his great industry, punctuality, and practical readiness, than by eminence in the science of his profession. He was a most agreeable companion, full of pleasantry and good humor, and welcomed in every society. He acquired a handsome fortune, and died in May, 1773, leaving three daughters: the portion which came on that event to Mrs. Jefferson, after the debts should be paid, which were very considerable, was about equal to my own patrimony, and consequently doubled the ease of our circumstances. When the famous Resolutions of 1765, against the Stamp Act, were proposed, I was yet a student of law in Williamsburg. I attended the debate, however, at the door of the lobby of the House of Burgesses, and heard the splendid display of Mr. Patrick Henry's talents as a popular orator. They were great indeed; such as I have never heard from any other man. He appeared to me to speak as Homer wrote. Mr. Johnson, a lawyer, and member from the Northern Neck, seconded the resolutions, and by him the learning and the logic of the case were chiefly maintained. My recollections of these transactions may be seen page 60 of the life of Patrick Henry, by Wirt, to whom I furnished them. In May, 1769, a meeting of the General Assembly was called by the Governor, Lord Botetourt. I had then become a member; and to that meeting became known the joint resolutions and address of the Lords and Commons, of 1768-9, on the proceedings in Massachusetts. Counter-resolutions , and an address to the King by the House of Burgesses, were agreed to with little opposition, and a spirit manifestly displayed itself of considering the cause of Massachusetts as a common one. The Governor dissolved us: but we met the next day in the Apollo of the Raleigh tavern, formed ourselves into a voluntary convention, drew up articles of association against the use of any merchandise imported from Great Britain, signed and recommended them to the people, repaired to our several counties, and were re-elected without any other exception than of the very few who had declined assent to our proceedings. Nothing of particular excitement occurring for a considerable time, our countrymen seemed to fall into a state of insensibility to our situation; the duty on tea, not yet repealed, and the declaratory act of a right in the British Parliament to bind us by their laws in all cases whatsoever, still suspended over us. But a court of inquiry held in Rhode Island in 1762, with a power to send persons to England to be tried for offences committed here, was considered, at our session of the spring of 1773, as demanding attention. Not thinking our old and leading members up to the point of forwardness and zeal which the times required, Mr. Henry, Richard Henry Lee, Francis L. Lee, Mr. Carr and myself agreed to meet in the evening, in a private room of the Raleigh, to consult on the state of things. There may have been a member or two more whom I do not recollect. We were all sensible that the most urgent of all measures was that of coming to an understanding with all the other colonies, to consider the British claims as a common cause to all, and to produce a unity of action: and, for this purpose, that a committee of correspondence in each colony would be the best instrument for intercommunication : and that their first measure would probably be, to propose a meeting of deputies from every colony, at some central place, who should be charged with the direction of the measures which should be taken by all. We, therefore, drew up the resolutions which may be seen in Wirt, page 87. The consulting members proposed to me to move them, but I urged that it should be done by Mr. Dabney Carr, my friend and brother-in-law, then a new member, to whom I wished an opportunity should be given of making known to the house his great worth and talents. It was so agreed; he moved them, they were agreed to nem. con. and a committee of correspondence appointed, of whom Peyton Randolph, the speaker; was chairman. The Governor (then Lord Dunmore) dissolved us, but the committee met the next day, prepared a circular letter to the speakers of the other colonies, inclosing to each a copy of the resolutions, and left it in charge with their chairman to forward them by expresses. The origination of these committees of correspondence between the colonies has been since claimed for Massachusetts, and Marshall has given into this error, although the very note of his appendix to which he refers, shows that their establishment was confined to their own towns. This matter will be seen clearly stated in a letter of Samuel Adams Wells to me of April 2nd, 1819, and my answer of May 12th. I was corrected by the letter of Mr. Wells in the information I had given Mr. Wirt, as stated in his note, page 87, that the messengers of Massachusetts and Virginia crossed each other on the way, bearing similar propositions; for Mr. Wells shows that Massachusetts did not adopt the measure, but on the receipt of our proposition, delivered at their next session. Their message, therefore, which passed ours, must have related to something else, for I well remember Peyton Randolph's informing me of the crossing of our messengers. The next event which excited our sympathies for Massachusetts, was the Boston port bill, by which that port was to be shut up on the 1st of June, 1774. This arrived while we were in session in the spring of that year. The lead in the House, on these subjects, being no longer left to the old members, Mr. Henry, R. H. Lee, Fr. L. Lee, three or four other members, whom I do not recollect, and myself, agreeing that we must boldly take an unequivocal stand in the line with Massachusetts, determined to meet and consult on the proper measures, in the council-chamber, for the benefit of the library in that room. We were under conviction of the necessity of arousing our people from the lethargy into which they had fallen, as to passing events; and thought that the appointment of a day of general fasting and prayer would be most likely to call up and alarm their attention. No example of such a solemnity had existed since the days of our distresses in the war of '55, since which a new generation had grown up. With the help, therefore, of Rushworth, whom we rummaged over for the revolutionary precedents and forms of the Puritans of that day, preserved by him, we cooked up a resolution, somewhat modernizing their phrases, for appointing the 1st day of June, on which the portbill was to commence, for a day of fasting, humiliation, and prayer, to implore Heaven to avert from us the evils of civil war, to inspire us with firmness in support of our rights, and to turn the hearts of the King and Parliament to moderation and justice. To give greater emphasis to our proposition, we agreed to wait the next morning on Mr. Nicholas, whose grave and religious character was more in unison with the tone of our resolution, and to solicit him to move it. We accordingly went to him in the morning. He moved it the same day; the 1st of June was proposed; and it passed without opposition. The Governor dissolved us, as usual. We retired to the Apollo, as before, agreed to an association, and instructed the committee of correspondence to propose to the corresponding committees of the other colonies, to appoint deputies to meet in Congress at such place, annually, as should be convenient, to direct, from time to time, the measures required by the general interest: and we declared that an attack on any one colony, should be considered as an attack on the whole. This was in May. We further recommended to the several counties to elect deputies to meet at Williamsburg, the 1st of August ensuing, to consider the state of the colony, and particularly to appoint delegates to a general Congress, should that measure be acceded to by the committees of correspondence generally. It was acceded to; Philadelphia was appointed for the place, and the 5th of September for the time of meeting. We returned home, and in our several counties invited the clergy to meet assemblies of the people on the 1st of June, to perform the ceremonies of the day, and to address to them discourses suited to the occasion. The people met generally, with anxiety and alarm in their countenances, and the effect of the day, through the whole colony, was like a shock of electricity, arousing every man, and placing him erect and solidly on his centre. They chose, universally, delegates for the convention. Being elected one for my own county, I prepared a draught of instructions to be given to the delegates whom we should send to the Congress, which I meant to propose at our meeting. In this I took the ground that, from the beginning, I had thought the only one orthodox or tenable, which was, that the relation between Great Britain and these colonies was exactly the same as that of England and Scotland, after the accession of James, and until the union, and the same as her present relations with Hanover, having the same executive chief, but no other necessary political connection; and that our emigration from England to this country gave her no more rights over us, than the emigrations of the Danes and Saxons gave to the present authorities of the mother country, over England. In this doctrine, however, I had never been able to get any one to agree with me but Mr. Withe. He concurred in it from the first dawn of the question, What was the political relation between us and England? Our other patriots, Randolph, the Lees, Nicholas, Pendleton, stopped at the half-way house of John Dickinson, who admitted that England had a right-to regulate our commerce, and to lay duties on it for the purposes of regulation, but not of raising revenue. But for this ground there was no foundation in compact, in any acknowledged principles of colonization, nor in reason: expatriation being a natural right, and acted on as such, by all nations, in all ages. I set out for Williamsburg some days before that appointed for our meeting, but was taken ill of a dysentery on the road, and was unable to proceed. I sent on, therefore, to Williamsburg two copies of my draught, the one under cover to Peyton Randolph, who I knew would be in the chair of the convention, the other to Patrick Henry. Whether Mr. Henry disapproved the ground taken, or was too lazy to read it (for he was the laziest man in reading I ever knew) I never learned: but he communicated it to nobody. Peyton Randolph informed the convention he had received such a paper from a member, prevented by sickness from offering it in his place, and he laid it on the table for perusal. It was read generally by the members approved by many, though thought too bold for the present state of things; but they printed it in pamphlet form, under the title of A Summary View of the Rights of British America. It found its way to England, was taken up by the opposition, interpolated a little by Mr. Burke so as to make it answer opposition purposes, and in that form ran rapidly through several editions. This information I had from Parson Hurt, who happened at the time to be in London, whither he had gone to receive clerical orders; and I was informed afterwards by Peyton Randolph, that it had procured me the honor of having my name inserted in a long list of proscriptions, enrolled in a bill of attainder commenced in one of the Houses of Parliament, but suppressed in embryo by the hasty step of events, which warned them to be a little cautious. Montague, agent of the House of Burgesses in England, made extracts from the bill, copied the names, and sent them to Peyton Randolph. The names, I think, were about twenty, which he repeated to me, but I recollect those only of Hancock, the two Adamses, Peyton Randolph himself, Patrick Henry, and myself. The convention met on the 1st of August, renewed their association, appointed delegates to the Congress, gave them instructions very temperately and properly expressed, both as to style and matter; and they repaired to Philadelphia at the time appointed. The splendid proceedings of that Congress, at their first session, belong to general history, are known to every one, and need not therefore be noted here. They terminated their session on the 26th of October, to meet again on the 10th of May ensuing. The convention, at their ensuing session of March, approved of the proceedings of Congress, thanked their delegates, and reappointed the same persons to represent the colony at the meeting to be held in May: and foreseeing the probability that Peyton Randolph, their president, and speaker also of the House of Burgesses, might be called off, they added me, in that event, to the delegation. Mr. Randolph was, according to expectation, obliged to leave the chair of Congress, to attend the General Assembly summoned by Lord Dunmore, to meet on the 1st day of June, 1775. Lord North's conciliatory propositions, as they were called, had been received by the Governor, and furnished the subject for which this assembly was convened. Mr. Randolph accordingly attended, and the tenor of these propositions being generally known, as having been addressed to all the governors, he was anxious that the answer of our Assembly, likely to be the first, should harmonize with what he knew to be the sentiments and wishes of the body he had recently left. He feared that Mr. Nicholas, whose mind was not yet up to the mark of the times, would undertake the answer, and therefore pressed me to prepare it. I did so, and, with his aid, carried it through the House, with long and doubtful scruples from Mr. Nicholas and James Mercer, and a dash of cold water on it here and there, enfeebling it somewhat, but finally with unanimity, or a vote approaching it. This being passed, I repaired immediately to Philadelphia, and conveyed to Congress the first notice they had of it. It was entirely approved there. I took my seat with them on the 21st of June. On the 24th, a committee which had been appointed to prepare a declaration of the causes of taking up arms, brought in their report (drawn I believe by J. Rutledge) which, not being liked, the House recommitted it, on the 26th, and added Mr. Dickinson and myself to the committee. On the rising of the House, the committee having not yet met, I happened to find myself near Governor W. Livingston, and proposed to him to draw the paper. He excused himself and proposed that. I should draw it. On my pressing him with urgency, we are as yet but new acquaintances, sir, said he, why are you so earnest for my doing it? Because, said I, I have been informed that you drew the Address to the people of Great Britain, a production, certainly, of the finest pen in America. On that, says he, perhaps, sir, you may not have been correctly informed. I had received the information in Virginia from Colonel Harrison on his return from that Congress. Lee, Livingston, and Jay had been the committee for that draught. The first, prepared by Lee, had been disapproved and recommitted. The second was drawn by Jay, but being presented by Governor Livingston, had led Colonel Harrison into the error. The next morning, walking in the hall of Congress, many members being assembled, but the House not yet formed, I observed Mr. Jay speaking to R. H. Lee, and leading him by the button of his coat to me. I understand, sir, said he to me, that this gentleman informed you, that Governor Livingston drew the Address to the people of Great Britain. I assured him, at once, that I had not received that information from Mr. Lee, and that not a word had ever passed on the subject between Mr. Lee and myself; and after some explanations the subject was dropped. These gentlemen had had some sparrings in debate before, and continued ever very hostile to each other. I prepared a draught of the declaration committed to us. It was too strong for Mr. Dickinson. He still retained the hope of reconciliation with the mother country, and was unwilling it should be Lessened by offensive statements. He was so honest a man, and so able a one, that he was greatly indulged even by those who could not feel his scruples. We therefore requested him to take the paper, and put it into a form he could approve. He did so, preparing an entire new statement, and preserving of the former only the last four paragraphs and half of the preceding one. We approved and reported it to Congress, who accepted it. Congress gave a signal proof of their indulgence to Mr. Dickinson, and of their great desire not to go too fast for any respectable part of our body, in permitting him to draw their second petition to the King according to his own ideas, and passing it with scarcely any amendment. The disgust against this numility was general; and Mr. Dickinson's delight at its passage was the only circumstance which reconciled them to it. The vote being passed, although further observation on it was out of order, he could not refrain from rising and expressing his satisfaction, and concluded by saying, there is but one word, Mr. President, in the paper which I disapprove, and that is the word Congress; on which Ben Harrison rose and said, There is but one word in the paper, Mr. President, of which I approve, and that is the word Congress. On the 22d of July, Dr. Franklin, Mr. Adams, R. H. Lee, and myself, were appointed a committee to consider and report on Lord North's conciliatory resolution. The answer of the Virginia Assembly on that subject having been approved, I was requested by the committee to prepare this report, which will account for the similarity of feature in the two instruments. On the l5th of May, 1776, the convention of Virginia instructed their delegates in Congress, to propose to that body to declare the colonies independent of Great Britain, and appointed a committee to prepare a declaration of rights and plan of government. In Congress, Friday, June 7, 1776. The delegates from Virginia moved, in obedience to instructions from their constituents, that the Congress should declare that these United colonies are, and of right ought to be, free and independent states, that they are absolved from all allegiance to the British crown, and that all political connection between them and the state of Great Britain is, and ought to be, totally dissolved; that measures should be immediately taken for procuring the assistance of foreign powers, and a Confederation be formed to bind the colonies more closely together. The House being obliged to attend at that time to some other business, the proposition was referred to the next day, when the members were ordered to attend punctually at ten o'clock. That it was more likely they should form a connection with the British court, who, if they should find themselves unable otherwise to extricate themselves from their difficulties, would agree to a partition of our territories, restoring Canada to France, and the Floridas to Spain, to accomplish for themselves a recovery of these colonies. And that if these were agreed on, and our Declaration of Independence ready by the time our Ambassador should be prepared to sail, it would be as well as to go into that Declaration at this day. And that the only misfortune is, that we did not enter into alliance with France six months sooner, as, besides opening her ports for the vent of our last year's produce, she might have marched an army into Germany, and prevented the petty princes there, from selling their unhappy subjects to subdue us. 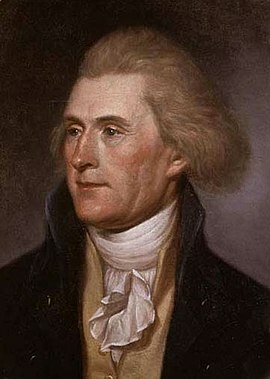 It appearing in the course of these debates, that the colonies of New York, New Jersey, Pennsylvania, Delaware, Maryland, and South Carolina were not yet matured for falling from the parent stem, but that they were fast advancing to that state, it was thought most prudent to wait a while for them, and to postpone the final decision to July 1st; but, that this might occasion as little delay as possible, a committee was appointed to prepare a Declaration of Independence. The committee were John Adams, Dr. Franklin, Roger Sherman, Robert R. Livingston, and myself. Committees were also appointed, at the same time, to prepare a plan of confederation for the colonies, and to state the terms proper to be proposed for foreign alliance. The committee for drawing the Declaration of Independence, desired me to do it. It was accordingly done, and being approved by them, I reported it to the House on Friday, the 28th of June, when it was read, and ordered to lie on the table. On Monday, the 1st of July, the House resolved itself into a committee of the whole, and resumed the consideration of the original motion made by the delegates of Virginia, which, being again debated through the day, was carried in the affirmative by the votes of New Hampshire, Connecticut, Massachusetts, Rhode Island, New Jersey, Maryland, Virginia, North Carolina and Georgia. South Carolina and Pennsylvania voted against it. Delaware had but two members present, and they were divided. The delegates from New York declared they were for it themselves, and were assured their constituents were for it; but that their instructions having been drawn near a twelve month before, when reconciliation was still the general object, they were enjoined by them to do nothing which should impede that object. They, therefore, thought themselves not justifiable in voting on either side, and asked leave to withdraw from the question; which was given them. The committee rose and reported their resolution to the House. Mr. Edward Rutledge, of South Carolina, then requested the determination might be put off to the next day, as he believed his colleagues, though they disapproved of the resolution, would then join in it for the sake of unanimity. The ultimate question, whether the House would agree to the resolution of the committee, was accordingly postponed to the next day, when it was again moved, and South Carolina concurred in voting for it. In the meantime, a third member had come post from the Delaware counties, and turned the vote of that colony in favor of the resolution. Members of a different sentiment attending that morning from Pennsylvania also, her vote was changed, so that the whole twelve colonies who were authorized to vote at all, gave their voices for it; and, within a few days, the convention of New York approved of it, and thus supplied the void occasioned by the withdrawing of her delegates from the vote. Congress proceeded the same day to consider the Declaration of Independence, which had been reported and lain on the table the Friday preceding, and on Monday referred to a committee of the whole. The pusillanimous idea that we had friends in England worth keeping terms with, still haunted the minds of many. For this reason, those passages which conveyed censures on the people of England were struck out, lest they should give them offence. The clause too, reprobating the enslaving the inhabitants of Africa, was struck out in complaisance to South Carolina and Georgia, who had never attempted to restrain the importation of slaves, and who, on the contrary, still wished to continue it. Our northern brethren also, I believe, felt a little tender under those censures; for though their people had very few slaves themselves, yet they had been pretty considerable carriers of them to others. The debates, having taken up the greater parts of the 2d, 3d, and 4th days of July, were, on the evening of the last, closed; the Declaration was reported by the committee, agreed to by the House, and signed by every member present, except Mr. Dickinson. As the sentiments of men are known not only by what they receive, but what they reject also, I will state the form of the Declaration as originally reported. The parts struck out by Congress shall be distinguished by a black line drawn under them; and those inserted by them shall be placed in the margin, or in a concurrent column.